This could be the year Boulder City High School’s football team returns to postseason play, according to head coach Chris Morelli. Its last appearance was in 2014. 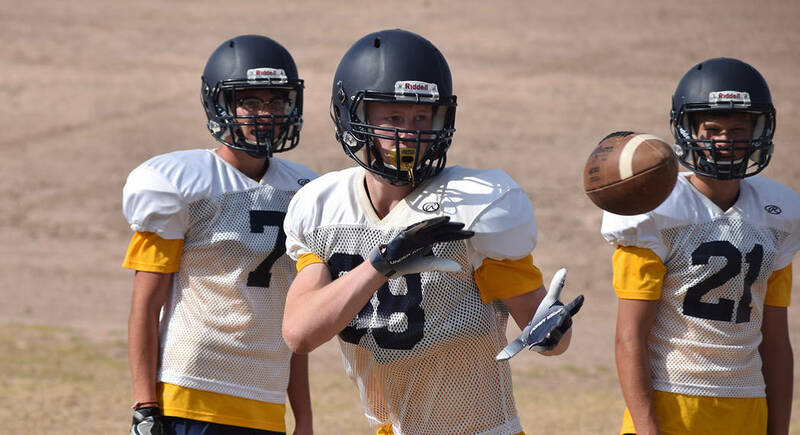 Robert Vendettoli/Boulder City Review Matt Morton, center, a sophomore at Boulder City High School, is expected to help lead a group of underclassmen in the football team's passing attack this season. The team, which is rejoining the 3A division after a year off as an independent, will get a boost from talent coming back from last year’s roster. Leading the Eagles’ charge on offense is senior running back Thorsten Balmer. Balmer has high expectations for himself, with his sights set on a 1,000-yard rushing season, after finishing last year with 836 rushing yards and 10 touchdowns on 116 carries. “My expectations for myself are very high this year because I have put so much work and effort this offseason into becoming the best player I can be for my team,” he said. Senior Jimmy Dunagan (203 rushing yards, one touchdown) is another capable rusher on offense, while seniors Tristan Chavez (five catches, 42 yards, one touchdown) and Shaun Jones (two catches, 32 yards) will lead an inexperienced receiving core. At 6 feet, 5 inches, Matt Morton leads a strong group of sophomores along with Trey Davis, Scott Bahde and Deavin Lopez that should help first-year junior quarterback Parker Reynolds in the passing attack. The Eagles will run a 4-2-5 defensive scheme, focused on getting pressure on the quarterback and making plays in the secondary. Returning to anchor the defense will be Dunagan (50 tackles, one interception), Balmer (25 tackles), senior Travis Hungerford (10 tackles and three interceptions) and Ryan Vanario (15 tackles, four sacks). The Eagles will host Cheyenne on Friday in their home opener.